Although some restaurants might only take reservations, a lot of them rely on walk-ins. If you want to attract people walking by, you need to have the right hook to get them to stop and enter. Restaurant signs play a significant role in this, both as your name above the door and additional signs. 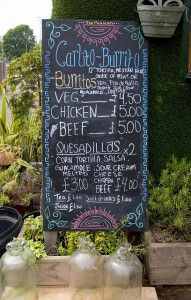 For example, a chalkboard or A-board with your special offers on it could make all the difference. Some people know just how to draw their customers in with their signage. Check out some of these restaurants that are doing signs their own way. This restaurant in Brooklyn, New York definitely has a unique selling point. 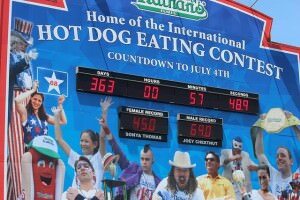 There aren’t many restaurants who can claim they have an international event. And this establishment knows it. They’re aware that they have something special, and they’re emphasising it in a big way. You won’t miss this sign if you’re walking past their restaurant. This Mexican restaurant knows just how to catch someone’s eye. Some of the most successful restaurant signs are colourful and bold. They encourage people to look for longer. 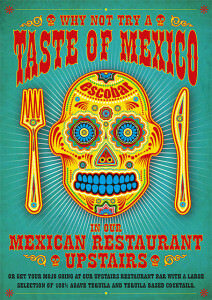 Their choice to use the Mexican imagery is fun and whimsical, and it plays on their theme. They have a direct call to action too, and the hypnotic eyes of the skull don’t hurt either. This restaurant knows what people come to them for. They clearly specialise in steaks, and they’re not afraid to show it. Sometimes it’s best to keep things simple and focus on what you’re good at. The fancy shape of the chalkboard sign on the brick wall has a cool shabby chic feel about it too, and they’ve just managed to squeeze in some drink specials. It wouldn’t take you long to guess that this restaurant is called The Orangery. Their orange motif around the chalkboard is memorable and perfectly matches their name. 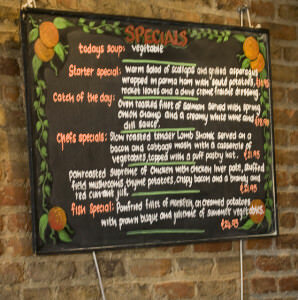 They use their custom board to display their specials, so the dishes and prices are clear for everyone to see. It will be easy for them to change the specials every day but keep their beautiful design. 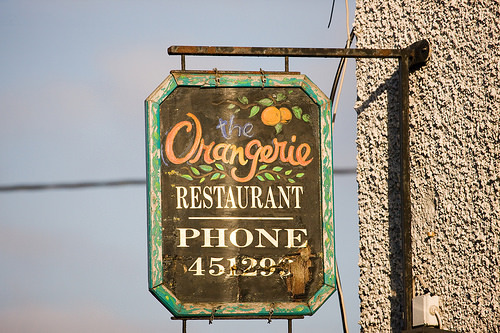 Outside the restaurant front signage matches the internal signage and the weathered look implies the rustic and relaxed feel you’ll find inside. This long chalkboard lays out the restaurant’s menu for everyone to see. With few items, it’s easy to make it clear to everyone what’s available. With burritos, quesadillas and drinks on the menu, what else do they need? There’s even room for a beautiful border to make everything more attractive and get people’s attention as they walk by. This dessert sign has fun with fonts for a big impact with little effort. Just mixing up the different typefaces makes each item stand out. There isn’t too much crammed on the board, so you can see clearly everything that’s on there. 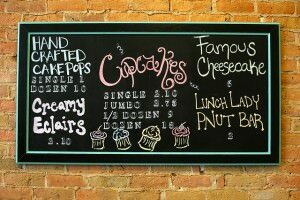 Some whimsical cupcake drawings at the bottom are the icing on the cake of this cute sign. 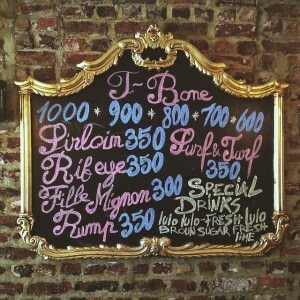 Restaurant signs don’t have to be complicated to be effective. You can have a significant impact just by thinking creatively and strategically. If your external and internal signage align with the look, feel and atmosphere you’re aiming for then it helps to create a character for your restaurant that is easily identifiable to your customers.